Red Dead Online’s next set of updates will smooth out some of the pain points players are experiencing while making the world feel a little more alive and active. The update will include new law and bounty systems, changes to player blips, and other balance changes. In the upcoming patch, player blips are hidden unless you are within 150 meters of another player. The radius is larger for players who are firing their gun. This will make griefing substantially harder since it’ll be nearly impossible to track poor souls who run away from bandits. Players who are too aggressive will also have their blip darken in color and become increasingly visible. This change applies to their entire posse. “Overly aggressive acts” are defined as attacking and killing players outside of a structured mode or free roam mission. You’re free to contest a posse trying to deliver a buggy without racking up notoriety, but if you gun someone’s horse down, you’ll start to become a target. Rockstar has also introduced better systems for posses to interact with each other. Posse-wide parleys will be possible now, letting you make yourself invulnerable against an entire group of players if just one of them has killed you. There are also new posse feud modes that can trigger upon open world combat in this new patch. If you encounter another group of players on the open plains and violence breaks out, you can enter a timed mini-deathmatch. These can take place between between just two players, the posse’s leaders, or the entire groups of both posses. THIS kind of camping is okay. Rockstar is adding another stick to deter bad behavior: Criminals in Red Dead Online can rack up bounties, bringing NPC bounty hunters down on their heads. Much like Grand Theft Auto’s five-star police system, a higher bounty will inspire a much larger and better prepared group of bounty hunters. Larger crimes, like killing other players or mowing through the population of Rhodes, will give you both a bounty and lower your honor. Smaller scale crimes, like stealing from a home, only decrease your honor but will not incur a bounty. 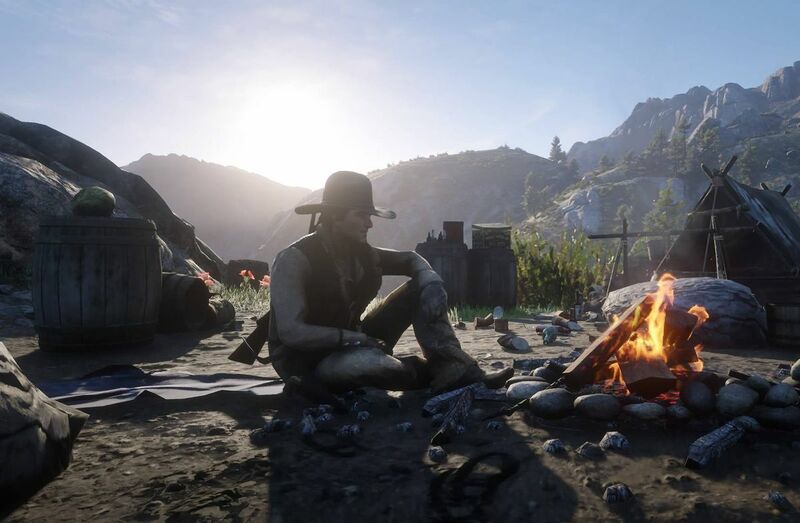 Finally, Rockstar is tweaking the Varmint Rifle’s accuracy and tweaking pelts and carcasses to last longer after death or respawning. These are just the first steps in continual rebalancing and changes that are expected to occur over the course of the Red Dead Online beta. Before the Feb. 26 patch hits, Rockstar are introducing posse experience bonuses. Playing in a posse will grant extra experience. Free roam activities and missions will receive a 2X experience bonus applying until Feb. 19, and then a 20% XP boost on all activities will be applied until Feb. 26.